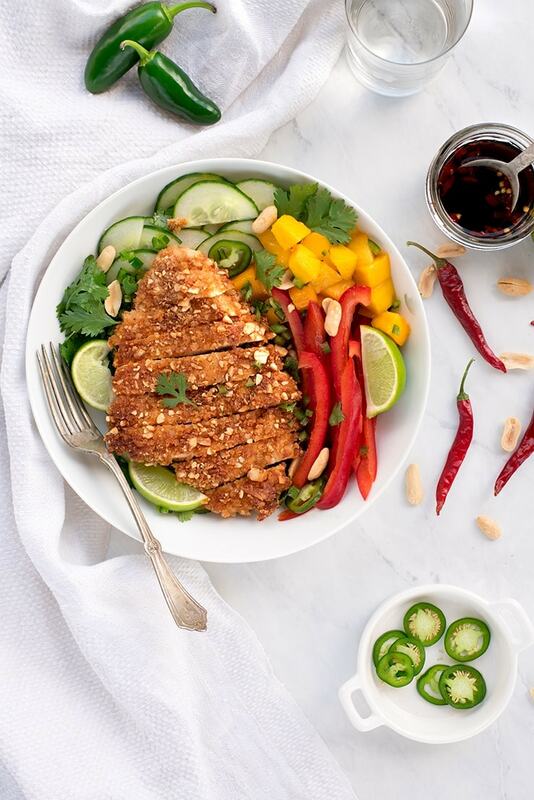 Pan-fried, crispy peanut chicken is your new weeknight dinner favorite! Keep the salad routine from getting boring. 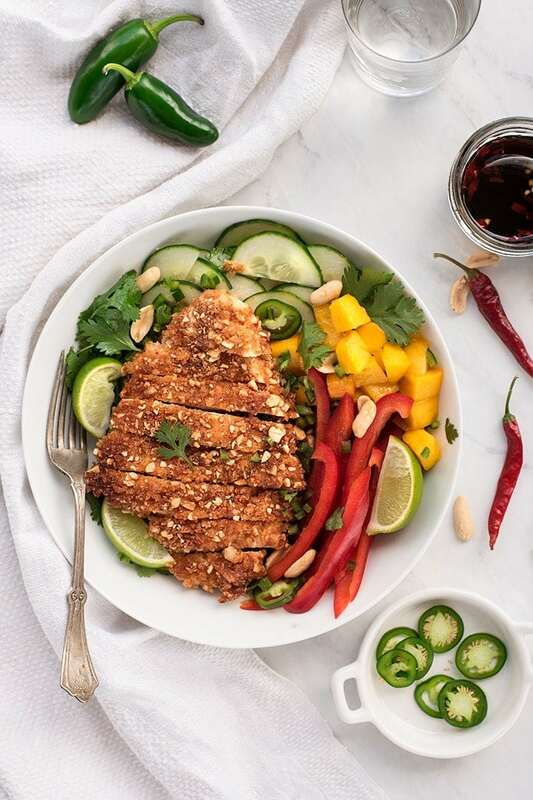 Peanut crusted chicken tops this crunchy asian salad with an easy, homemade dressing. 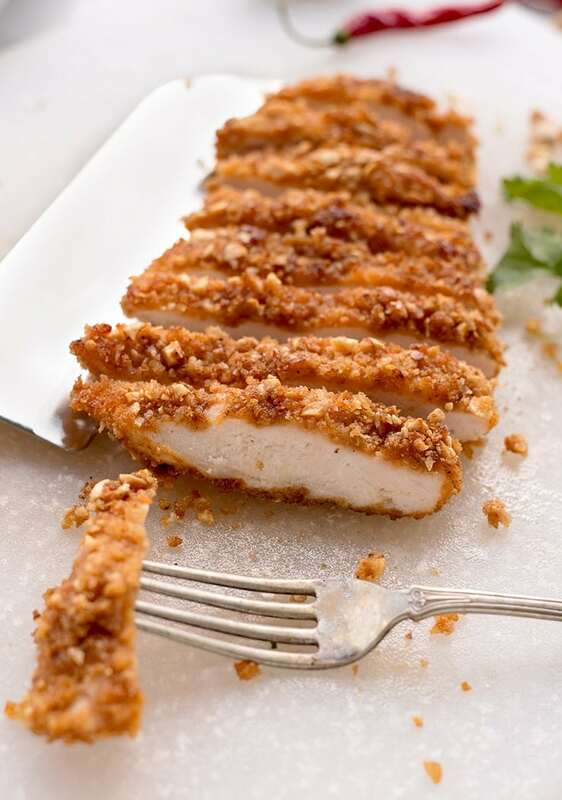 Who loves a crispy, pan-fried chicken breast? ME! ME! But we’re making it so much more fun with peanuts and peanut powder. If you haven’t jumped on the peanut powder bandwagon yet, I’m here with another delicious recipe to convince you how awesome it is! As if these CHEWY PEANUT BUTTER COOKIES and this PEANUT BRITTLE POPCORN TOPPING weren’t tempting enough! What I love about peanut powder is that it can replace some of the flour in a recipe. This equals more flavor, less carbs and more protein. The downside to peanut powder is that it is quite absorbent, which is why it’s not a good 1:1 replacement for flour. We learned this through trial and error. Too much peanut powder and the chicken came out soggy. Too little and the peanut flavor doesn’t shine. Recipe testing is hard work but here’s the awesome result! Outside the crust is crispy and golden while inside the chicken is moist and flavorful. 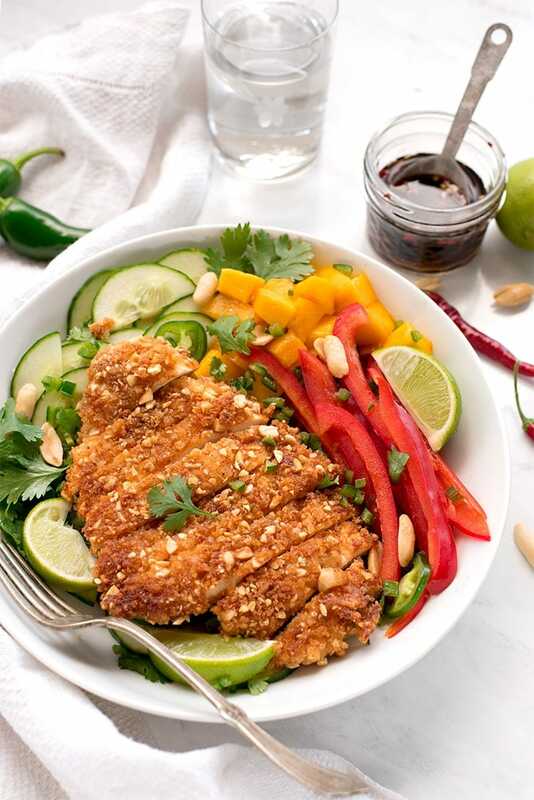 And to keep things on the lighter side, we paired our crispy peanut chicken with a crunchy asian salad. It’s a little sweet, a little spicy and just the right amount of salty to compliment the peanut chicken. Because breading the chicken is messy work, we kept things simple for the salad. 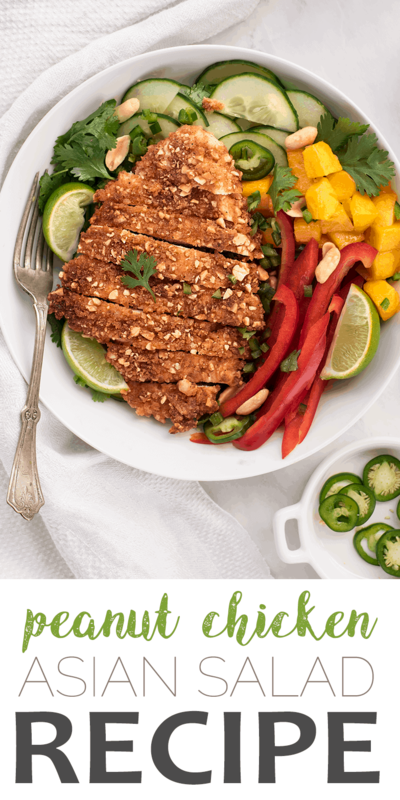 It has fresh mango, sweet red bell peppers and crunchy cucumbers topped with jalapeno and cilantro. The dressing takes like two minutes to make and is made with asian pantry staples. Easy peasy!!!! It’s so delicious! But more importantly it’s a filling salad, so no one is going to complain after dinner that they’re still hungry. Trust me! I tried this on a couple of the men in my life! After dinner I had to convince them they had room for dessert! hahaha! It hits all those tasty, flavorful, sweet, and salty notes with an extra side of peanuty, crispy, crunchy! 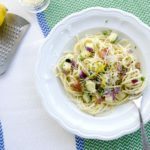 So delicious and sure to be a new weeknight dinner favorite! You’ll need three bowls for breading. I usually use leftover plastic carryout containers. They’re nice because if you want to prep the ingredients in advance they have lids. Safety is key with raw chicken. 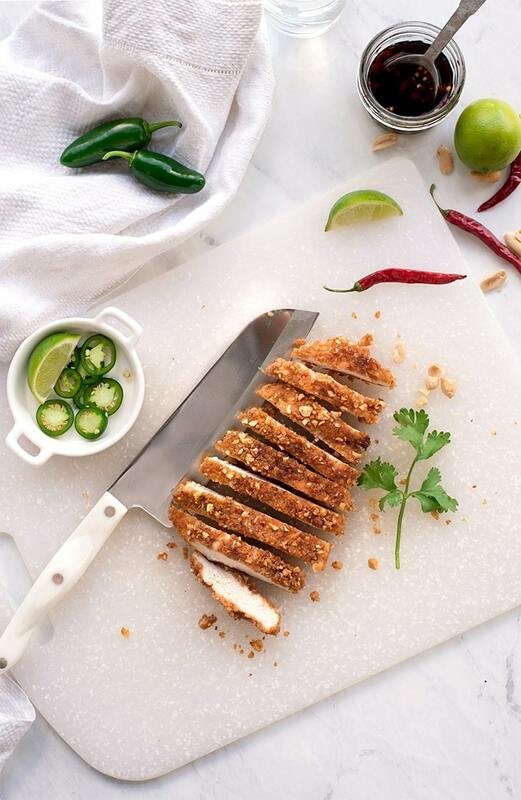 Pound your chicken on a plastic cutting board away from your fresh cut veggies. I use a double or triple layer of plastic wrap to avoid splashing, but always disinfect your work area after pounding the chicken. I pound chicken with a very heavy glass, you know the super heavy tumbler kind? But you can also use a meat mallet or rolling pin. Make sure the shiny side of the meat is up. That connective tissue will hold the breast together. Don’t pound too much or you end up with holes in your chicken. When breading, start with the flour, then dip in the egg batter and finally the panko peanut mixture. Place the breaded chicken on the cutting board and fry one to two breasts at a time. Don’t overcrowd the pan! If your frying oil gets overly dirty with burnt bits, carefully dump out the oil into a paper plate or cup and wipe out the pan with a paper towel. Add fresh oil and get the oil hot before frying. Unless your chicken is super thin, the outside of the chicken will be cooked before the inside. Transfer the chicken to a clean sheet pan and finish baking in the oven. Always use a thermometer! I stop cooking at 160F but make sure the chicken reaches 165F before serving. Use clean utensils and cutting board after cooking to avoid cross contamination. Here's a weeknight salad your whole family will cheer for! I'm always a fan of stretching a chicken and with this recipe, two chicken breasts easily feed a family of four. But with the addition of peanuts, you won't be skimping on the protein. Turn on oven to 250F and prepare a cookie sheet with parchment. Gather three dishes to bread chicken. In the first place the flour and lime zest; the second the egg, coconut milk and cayenne; and in the third the peanut powder, chopped peanuts, panko bread crumbs, salt and pepper. Make sure each is mixed thoroughly. Cut the chicken breasts in half. Pound each piece on a cutting board, covering the chicken with a double layer of plastic wrap. Dredge each piece of chicken starting with the flour mixture, then the egg and finally the peanut mixture. Once the oil is hot, fry one or two pieces at a time, flipping once the breading is golden brown. When both sides are golden, transfer to cookie sheet and place in the oven to finish cooking (to 165F). If your chicken is pounded very thinly they may already be done. If so, turn the oven to warm while you finish the salad. Crumble the hot chile pepper into a small jar and add remaining dressing ingredients. Give the dressing a stir every few minutes until the sugar melts. 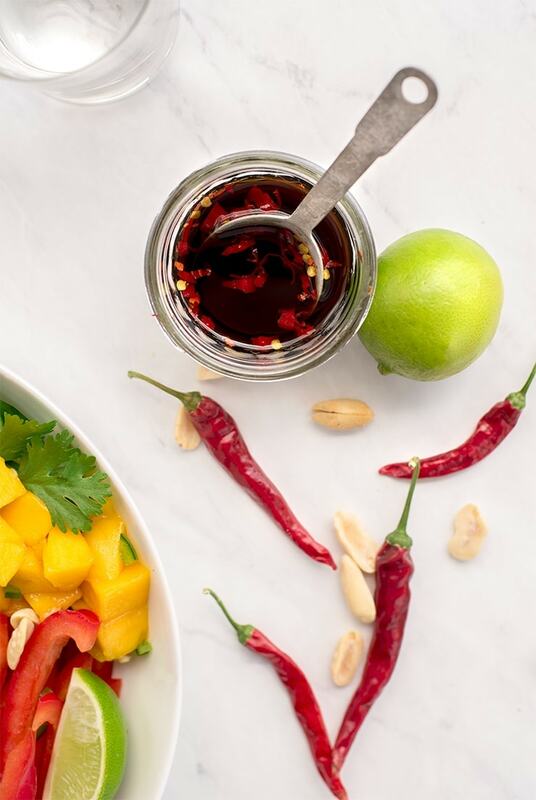 In a bowl combine the red pepper, cucumbers, jalapenos, cilantro and mango. Toss salad with the dressing. 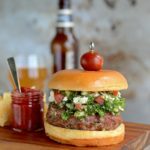 These Tabouleh Turkey Burgers with Feta and Harissa are a fresh take on the classic grilled burger. Oh. My. Gosh. I am going to be dreaming about this awesome salad for like, days now! Love that its filled with all kinds of great flavors and textures! Totally putting this on my meal plan for next week! That’s awesome Jenni! Hope you and the family love it! We love Asian flavors in our house! I know this is going to become a family favorite! Awesome! Rock out that dinner salad Sabrina! That’s the most perfect chicken that I’ve ever seen! 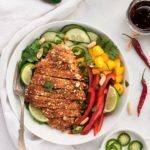 This salad is seriously calling my name; I love crispy chicken on salad! We do too! Love it even more when I don’t have to feel guilty about it! This is such a fantastic dinner recipe!!! This is a complete, flavorful salad meal! I love the addition of peanut powder for a unique and definitely Asian flavor. I am hungry looking at this! Yes, it’s so Asian. We used to have a similar chicken at a chinese buffet. This sounds so good! I know I would love it! I have been making so many chicken salads these days and this recipe look awesome,with right heat and crisp looking chicken.Will try this next. Call me crazy, but chicken never gets old for me. It takes flavors so well that you can keep it fun by switching up cooking styles and seasonings. Hope you love it! If you are a fan of Thai and like spicy foods, the cayenne and hot pepper can be increased. I like the chicken with an extra kick! I can’t believe how perfectly crispy this coating looks! Your photos are so gorgeous too! Thanks Anna! The peanuts and panko make the coating super crispy! My heavens! This meal belongs on a restaurant’s menu!! It looks and sounds fantastic. I love the combination of the peanut chicken and Asian salad. I agree!! This is definitely going on my weeknight menu. Thanks Marisa! I would love a gig creating restaurant dishes! And this would be a hit on any menu, including your kitchen menu! So glad to inspire you Karyl! Always love to see what you’re cooking! Ooooh our summer dinner staple is generally grilled protein on a salad. This looks like such a good deviation and that crispy breaded chicken will be an extra special dinner treat. We eat a ton of grilled meats on salads during the summer too! But it is fun to change it up with a better for you fried chicken. My friend made me the most amazing potsticker bowls while I was visiting in town. 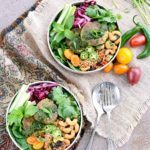 It got us to thinking about other Asian food and this salad would be a wonderful appetizer to start with! Yes, this would be a great appetizer too! It’s quite filling, so I’d say as an appetizer, this would feed an army. Maybe cut the recipe in half and julienne the veggies and serve in a lettuce cup? If you try it, let me know how it goes! Exactly! When it’s hot I can’t eat heavy dinners! That crispy chicken looks so good but that salad it is on is the star of the show! Love the colors! This looks perfect! This chicken looks succulent and absolutely amazing! This whole salad works. Thanks Nicole! It really is a great match!